Model PDSA separator is mainly used to remove water and algae such as Spirulina,green algae etc in the lake and sea. which is very fine even can not be visible by eye. With high G-force during the running, the separator could get the concentration liquid with algae about 10%. The machine adopts automatic control, it has the advantages of high efficiency, low oil consumption, convenient operation and economic maintenance cost.The sludge is discharged automatically and fully. The machine is one kind of rotary machine with high speed, After accurate dynamic balancing, it can run for long time with low vibration, safety and security. The design, product and acceptance are conformed to the standard of GB/T5745 “Disc Separator”. 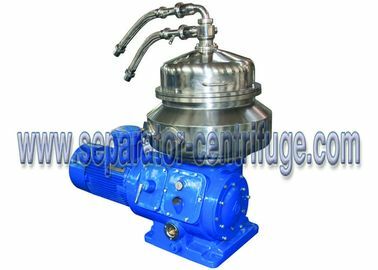 variable discharging means(adopting double small valve variable discharging structure, the partial discharging mode combined with full discharging mode,achieving the variable discharging by changing through electric control parameters to increase separator's discharging reliability. both vertical shaft and horizontal shaft are made of 20Cr13, all bearings are adopt SKF brand. The equipment has vision glass and sampling export. Machine cover and machine body adopt mezzanine cooling, it can decrease the temperature of shell, also decrease the vibration and noise of the whole machine. The equipment adopt variable frequency starting, it no need to change the friction plate and lubricating oil. 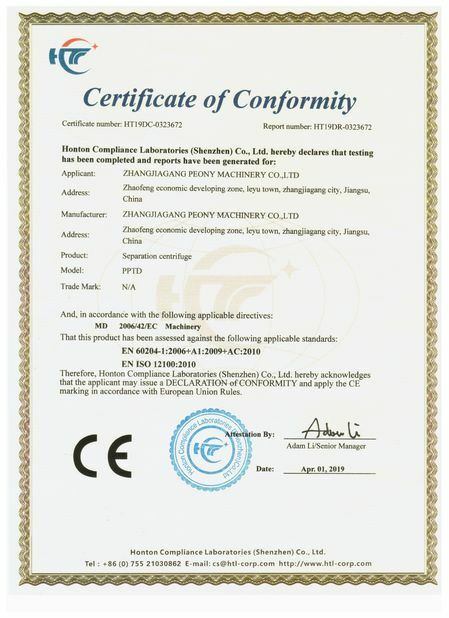 The equipment adopt vibration alarm device, in case the vibration strongly exceeds a set value, alarm start, if long time nobody handle, the machine will stop automatically. In case over current or over load, the machine will stop automatically, ensure that the machine safely operation. The equipment is automatic and manual dual operation. The equipment with internal removable form, it can achieve the purpose of clean the inner part which is sealed, ensure the equipment and annex no cleaning dead corner. The equipment's inner part with polishing,outer parts with dull processing, the screws,screw nuts and flat pad are made of SUS304, all interfaces are 1.6MPa flange interfaces or quick chuck.